I just saw that Nick Redfern's book, "Nessie: Exploring the Supernatural Origins of the Loch Ness Monster", has appeared on Amazon with a publication date of September 8th, 2016. I note the American site offers kindle and paperback versions, while the British site offers only kindle. I am sure that will change over time. As an aside, I noticed Nick's book was categorized under "Religion & Spirituality" while the more biographical book "A Monstrous Commotion" was filed under "Social Sciences/Anthropology". It seems the subject of the Loch Ness Monster covers a plethora of disciplines. BTW, is there a difference between "supernatural" and "paranormal"? This also prompted me to produce this graph, it is the number of books and booklets published exclusively on the Loch Ness Monster or with a good part devoted to it since the 1930s on a decade basis. It is based on the list I maintain here but does not include reprints and revisions. Not surprisingly, the 1970s was the top decade, boasting 23 publications with the 1980s second with 14. However, this decade looks set to grab second place with a current projected total of 10 going into this year and with another three years to go. The projections suggests we could end up with 16 books by the end of 2019. Perhaps this is not so surprising in this age of online self-publishing. Mind you, the 1970s had its fair share of tatty tourist booklets and boilerplate books. 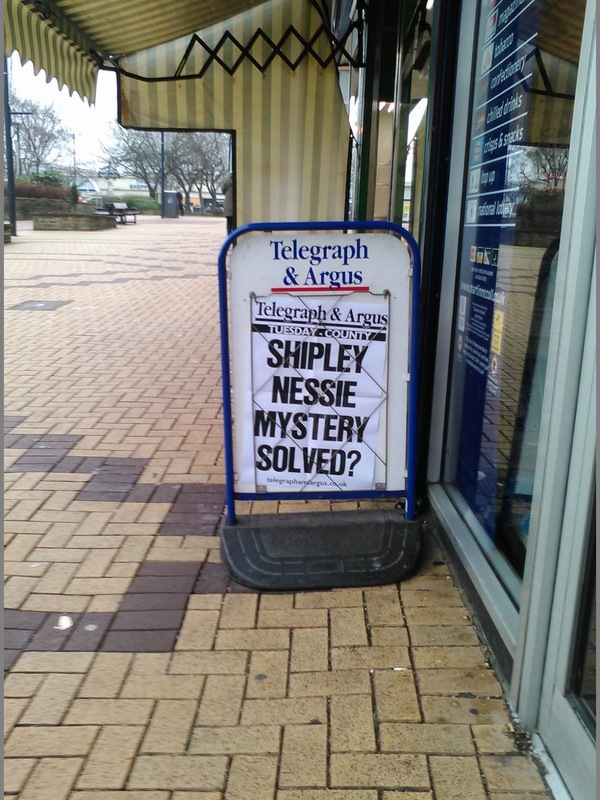 Hard on the heels of the latest news items about Gordon Holmes' video, the local Telegraph and Argus newspaper ran a snap poll asking "Do you believe in the Loch Ness Monster?". In total, 45% said "yes" or double what I have seen elsewhere. Nice one, Yorkshire! New Record Depth for Loch Ness? Has a new depth of 889 feet been recorded in Loch Ness, beating the established record of 754 feet by 135 feet? 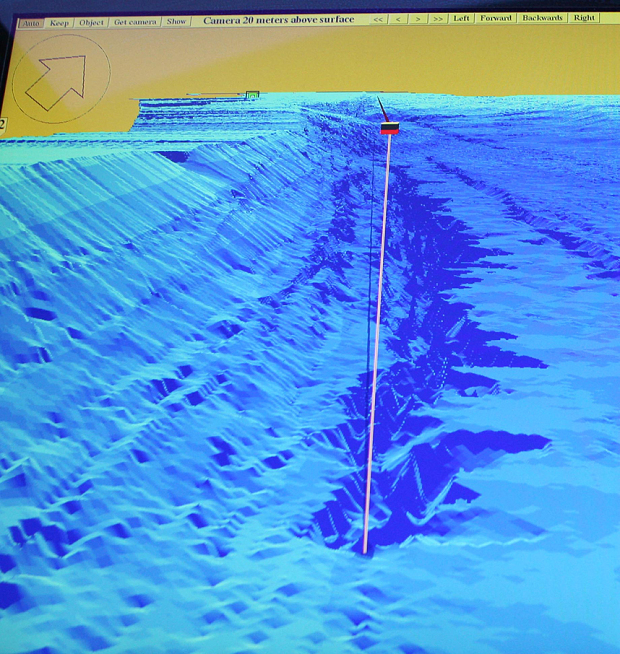 New sonar readings suggest so, but some third party verification may be required here. You may remember "Edward's Deep" of 812 feet which failed to stand up to verification, so some caution is required when side echoes from the loch all can "muddy" the waters. But two weeks ago, I got a sonar image of what looked like a long object with a hump lying at the bottom. It wasn't there when I scanned the loch bed later. Link to original story here and also here. It has evaded capture for years, with dozens of alleged sightings and endless speculation about its whereabouts. But the hunt for the Loch Ness monster has just become even more arduous, after a retired fisherman used sonar equipment to show that it could be hiding at previously undiscovered depths. Tourist sightseeing boat skipper Keith Stewart, 43, claims to have found a crevice large enough for the phantom beast to be hiding in, about nine miles east of Inverness. Britain's deepest loch is Loch Morar, allegedly home to another elusive “water kelpie” Morag at 1017 feet. Loch Ness is the UK’s second largest, with an official maximum depth previously recorded at 754 feet. However, Mr Stewart says that his newly discovered crevice measures 889 feet deep, according to his state of the art sonar equipment. His colleagues at Jacobite Cruises, which operates sightseeing cruises down Loch Ness from Inverness, have labelled it “Keith's Abyss”. "I wasn't really a believer of the monster beforehand,” Mr Stewart said. “But two weeks ago, I got a sonar image of what looked like a long object with a hump lying at the bottom. It wasn't there when I scanned the loch bed later. "That intrigued me and then I found this dark shape about half way between the Clansman Hotel and Drumnadrochit which transpired to be a crevice or trench. “I measured it with our state of the art 3D equipment at 889 feet. I have gone back several times over the abyss and I have verified my measurements. "It is only about a few hundred yards offshore whereas previous sonar searches have traditionally been down the middle of the loch. Adrian Shine, leader of the scientific research organisation The Loch Ness Project, said that he and his colleagues “may well take a look at the area” identified by Mr Stewart. However, he urged caution about sonar readings taken close to the edge of the loch. “I would be cautious [about Mr Stewart’s findings] because there is an anomaly which occurs with sonar readings taken close to the side walls called lobe echos, which can give misleading results about the depth. 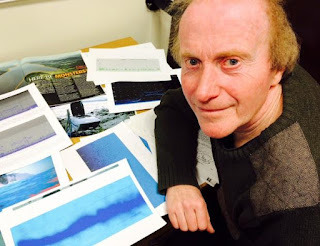 Gary Campbell, president of Loch Ness Monster Fan Club and Registrar of Sightings said that Mr Stewart’s discovery “adds another dimension” to the search for the phantom beast. “We thought the loch was 810 feet deep and just had a 20 foot diameter hole at the bottom,” he said. “Now we've discovered a whole trench that makes the loch nearly 900 feet deep which is twice the depth of the North Sea. There could be more trenches which make it deeper. Our Nessie man in Bradford, Gordon Holmes, continues to get publicity on his 2007 video of a strange object making its way up Loch Ness.His local newspaper has chimed in with a video of Gordon talking about his film as well as further information. The article can be found here and it seems it was making sufficiently big headlines. A LOCH Ness monster hunter from Shipley believes he could finally have helped solve the mystery of what really lurks beneath the water. A computer expert in the US has used advanced techniques to analyse a night-time film Gordon Holmes shot from a layby almost a decade ago. The analysist has now concluded the creature side-winding across the 800ft deep Scottish loch at about 6mph might in fact be a giant eel. 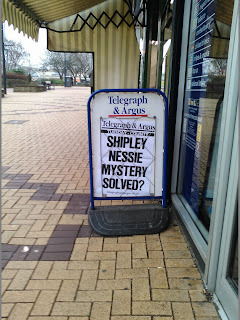 On May 26, 2007 Mr Holmes, of Shipley, was about to to finish Nessie-spotting for the day when he had his 'lucky break' looking through binoculars and had to make a mad-dash for his camcorder. The fascinating which appeared to show the black, long-necked monster-like creatures with flippers moving close to the surface swimming in the direction of Inverness, hit headlines worldwide ending in a media-frenzy. "There's been lots of opinions on what I filmed that night," said 63-year-old Mr Holmes, a retired university IT technician. "They do look eel-like on my film and I did say that back in 2007. One thing all the experts have agreed on is that my footage isn't fake." The film has been newly analysed by Bill Appleton, chief executive of US-based software firm DreamFactory, who was able to reduce camera shake and make the images clearer. Mr Holmes said: "Unless they discover some unknown creature from the depths of Loch Ness, I believe Bill has finally solved this major mystery in my life and the lives of many others. "He is not David Attenborough but he is an expert in his own field.". Mr Appleton has told leading Loch Ness investigators that Mr Holmes' footage had framed giant eels, concluding: "I believe they display a giant eel side-winding across the loch. "The animal is at least 10ft long, maybe 15f. You can see in some frames the classic, Plesiosaur neck, but this is just the eel moving away from the camera." Mr Holmes, who has featured in a TV show called Missing Evidence, plans to return to Loch Ness later this year with a new drone he has been test-flying over Ilkley Moor. He said: "Of course the mystery and intrigue will go on. "Unless I had concrete proof and the Loch Ness monster came out of the water, shook hands with me, then safely went back into the water I still can't be 100 per cent certain what it is and even if I was fortunate enough to get all of that on camera there would still be people who would not believe it. "With progression of science and software we are getting closer to the truth but we might be narrowing it down to more realistic things." Mr Holmes' first visit to Loch Ness to try to unravel the legend was in 2003 after his mother Winifred died from Alzheimers. She had given him a tiny glass ornament of Nessie bought from a gift shop in Saltaire when he was 12 and he has been fascinated ever since. Equipment he has built so far in a bid to track the real Loch Ness monster has included a hydrophone to pick up sound signals in the water, a spy in the sky camera carried by ten helium-filled foil balloons and now a new drone and a special raft trialled out at sea off Bridlington which will carry a weather-system and a camcorder. "I will keep going back. My search isn't over yet," he said.